The end of the year can be hard on homeschoolers looking across the fence to school kids. Kids at school are busy with all kinds of special events and end of year excitement. There are special award ceremony days, field days, and party days. Kids take special class trips to go camping or visit Washington, D.C. Then, of course, there are all the graduation ceremonies, from kindergarteners to high school seniors. It can be enough to make even some steadfast homeschoolers feel guilty about denying some of these rites of passage to their kids. Like everything else in homeschooling, the joy is that you can do it yourself. You decide what traditions you want and what’s important to honor or spend time on. 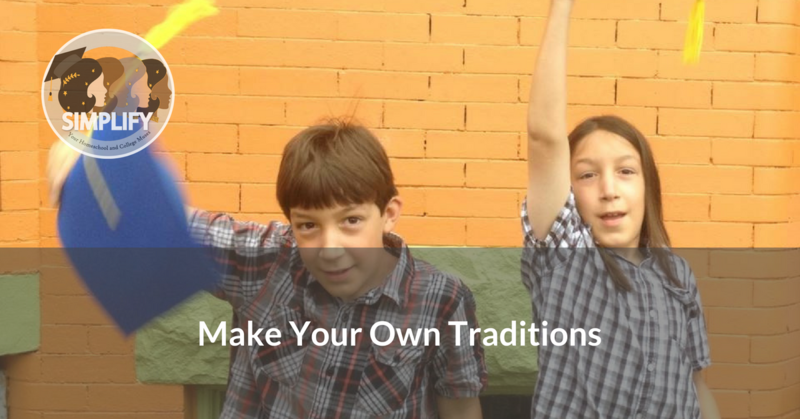 Make your own traditions! Marking time and recognizing passages can be positive things that make your homeschool a richer place. Making special moments for your kids to be honored for the work they do or to spend time with their friends can be important. As the school year draws to a close, you can do something to honor that if you want. Your kids have probably done some amazing things this year. You probably also deserve a pat on the back for getting everyone through it. Feel free to give yourself one! Your traditions can be elaborate if that’s what you want. For several years, there was a homeschool mom who planned a field day that we participated in a few times. It was great fun for the kids. Many homeschool communities have fancy graduation ceremonies with proper caps and gowns. On the other hand, your traditions can be silly or simple. A lot of families I know end the year with a meal out or start the school year with photos to serve as keepsakes. One family I know had waffles with whipped cream every time they finished a workbook or a unit study. Another family I know used to spend the district’s official first day of school in their pajamas watching TV all day, just to thumb their noses at the schoolkids. This is yet another aspect of homeschooling where you can make things work for your family. If your kids and extended family need serious traditions, make some. If you want to keep things simple, you can do that too. No matter what your traditions are, we at Simplify hope you had a good school year that’s either finishing up well or will coast on through the summer. If your summer holds homeschool or college planning and you need some help, reach out to us. We’d love to hear from you! Previous StoryAP, Dual Enrollment, or Something Else?